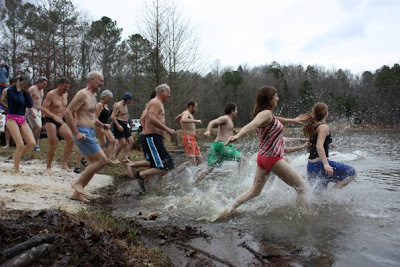 I swear, it's a complete coincidence that the annual New Years Day Redbud Polar Plunge began the year that we moved into the neighborhood. Yes, I may have been hanging around the tap at Rich's 60th birthday party, some three years ago, when the idea came bubbling up from the bottom of the keg, but, though the details of that evening still remain a bit murky, I'm certain that I wouldn't have encouraged such insanity in any way. But however it started, at noon today we stood ready to hit the water to start another year. But I'm getting ahead of myself here. Our New Years activities really begin the evening before with The Crawl. The Crawl is a tradition that predates our arrival by a good bit, but is one that Mary and I have embraced with enthusiasm. It's a progressive New Years Eve party, usually starting about where our road sheds its pavement and begins to climb the ridge. Along the way, the Crawl's participants visit a handful of homes and, at each stop, partake of a new libation, or two, for the evening. By the time the final house is visited and the stroke of midnight arrives, you begin to understand that the true meaning of "the Crawl" is that it may be the way that you are going to make your way back down the ridge to get home. This year we finished at our place, spending the early hours of the new year in a stand of widely spaced pines, keeping warm with hot buttered rum and a crackling fire. We sat around the pit until about 2:00am when everyone headed for home, hoping that we had taken on a sufficient supply of antifreeze to handle the upcoming Plunge. In the heart of our community, there sits a sweet little 8 acre pond that's the focal point of our Redbud social life. Usually quiet during the winter months, it begins to come alive around 11:30am New Years Day as we gather for the noon Plunge. This year, about 50 folks arrived, half to take the Plunge and the other half to marvel at the nobility and/or stupidity of the act. 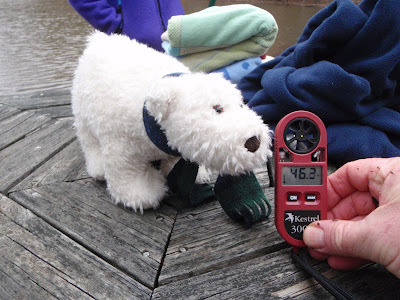 This year the air temperature was a brisk, but moderate, 46 degrees and the water was a few degrees warmer at 50, with an occasional wind kicking up to make things interesting. Three weeks earlier I had been standing comfortably in 36 degree water, trout fishing, with fleece leggings and a pair of soccer warmup pants under my waders but, today, it was just a swimsuit. Several minutes before noon, I shed my coat and warmup pants, leaving me in a long-sleeved t-shirt, swim trunks and crocs for my feet, to start getting acclimated to the cold. With a couple of minutes to go, I lost the shirt and prepared for the jump, jockeying for a place in the pack where I could get to clear water quickly. I wanted nothing to stop me once committed. At the stroke of noon, I and those bold (and crazy) enough to attempt it jogged down the small sand beach and hit the water. There's absolutely no way to describe the plunge itself so I won't even try. The "rules" say that all that is necessary is to enter the water and completely immerse. Some enter slowly (like Mary), others (like me) just dive in to get it over with, and almost everyone is out as quickly as they are in as there's no requirement to stay long. Getting in and out took only a few seconds and the effects of the bone chilling dunk quickly passed. Why is it that 50 degree water is so much colder than 46 degree air? 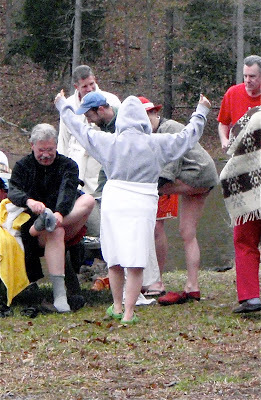 Today's 50 degree pond was freezing but, once out and toweled off, I felt fine hanging around in only my shorts and t-shirt. I must admit that the subsequent hot shower was hard to leave. The plunge itself is complete insanity, but the hanging around before and after it is a blast; a manic, shared joie de vivre that comes along with such an act. It's an amazing way to start a year, just as the Crawl is a joyful way to end one, and we hope to keeping doing each for years to come. The best part is that each is done here in a beautiful setting with a set of great neighbors, though I'm not entirely sure whether it's comforting, or disturbing, to know that I live among people who would jump into that frigid water. You certainly get to see your community in a whole new light. A couple of comments on the images in this post: The video clip was taken with my Olympus Tough 8000, tethered tightly around my wrist so that the shock of the cold water didn't send the camera to Davy Jones locker. The great image of the first wave of plungers was taken by my neighbor Martha Pearson and graciously donated for this post. (I was too busy getting dunked to capture that particular moment). Finally, the cutie celebrating another successful plunge is none other than my wife, Mary; a courageous lady and an all-around good sport. Looks like you guys had a blast. Great video and pictures. Can't wait to see what you have in store for 2010. ...and I thought that I was crazy! Never again will I complain about the heat in Georgia. Fishing in the 20’s is NUTS, but nothing compared to the activities enjoyed by Redbud residents! One can only hope that your community is one of the “Gated” varieties, and that it’s just as hard to get out as in. As witnessed on the video, at least some of your inhabitants need to be monitored by the authorities.